Below are three possible options to consider for resupply. There are a multitude of other options one could dream up as well. It is valuable to have a flexible mind when it comes to resupply. You may find yourself going slower or faster than expected. Hearing from other hikers about their experience in a particular town may influence your decision as well. Use the maps in conjunction with the trail town amenities page to help you make some preliminary choices before you start your hike. Avoiding a relatively longer section at the north end of the trail is difficult….because of the lack of towns and amenities within the towns that are there. 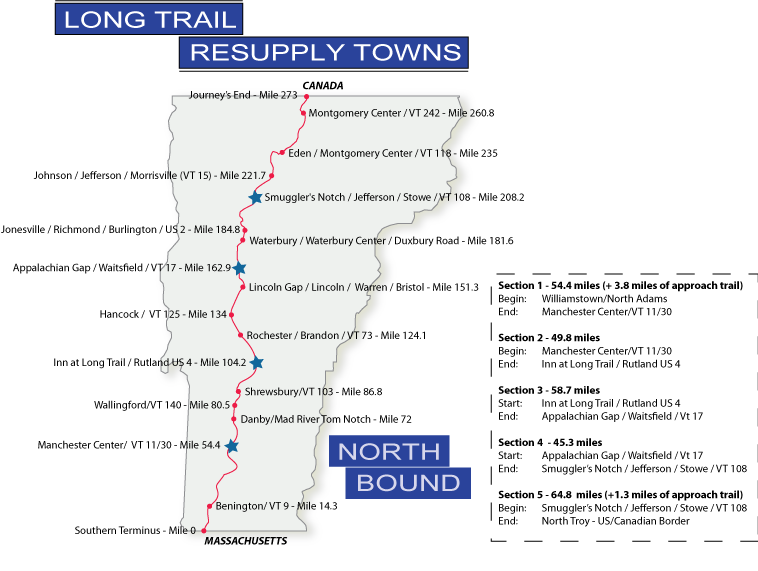 Keep in mind that the total hiking distance of the Long Trail is actually more than 273 miles. Both the southern terminus and northern terminus end in the middle of the woods, and you’ll need to hike an approach trail to get to transportation. These approach trails are not long. The maps keep in line with the typical 273 for understanding mileages as they relate to items in guidebooks, etc. 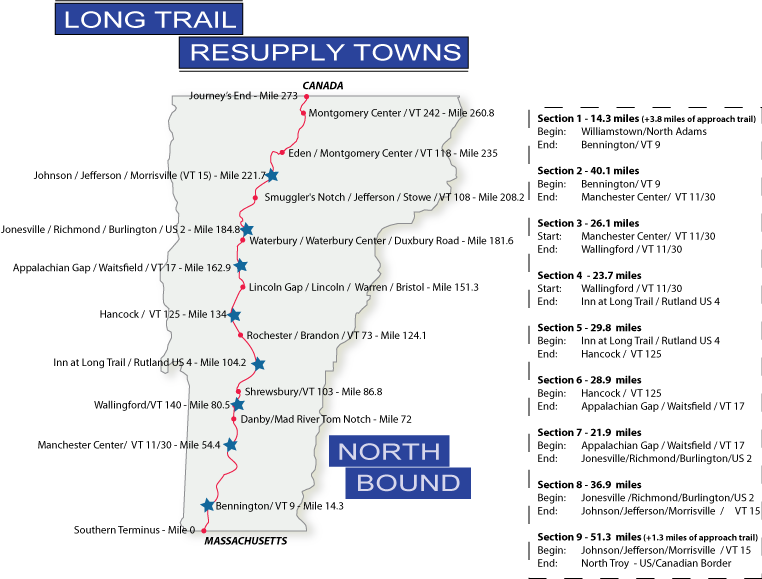 There are two ways to get to the southern terminus of the Long Trail. There is one way to get to the northern terminus of the Long Trail. *The maps may be best viewed on a desktop, laptop or tablet because of the amount info on each map. If using a mobile phone, it may be helpful to click on the map and pinch zoom to view. Click on a particular map to load it to a new window for printing. Printing for personal trail use is welcome. *Exact mileages may change depending on reroutes.